A Commercial High End cross trainer or elliptical designed to concentrate on the lower body. The 770A Arc Trainer has all of the features of the Total Body Arc Trainer without the Arm motion. Popular with coaches and trainers, the Lower Body Arc is often chosen because it gives added workout flexibility. Workouts- The 770 Arc Trainers unique workout selections allow the user to select their workout based specifically on their goals. Workouts include two Weight Loss, three Strength, two Shaping, and three Cardio including Heart Rate Control, as well as two Power workouts that include the Arc Trainers unique Adaptive Power mode. Muscle Map -displays the intensity of the exercise for individual muscle groups based on the users selection of stride rate, resistance and incline to aid them in precisely targeted results. Optional E3 View Monitor provides users selectable display of exercise data, TV or video, both or none. Two speed fan with adjustable venting to keep the user cool. ToughTrain 4.0 out of 5 Have suberb features but the only thing matters is its very high price. *Note: Most of the sites, stores or shopping portals listed above sell Cybex 770A Cross Trainer with discounts and other exciting offers. There is a possibility that the some of above websites are not selling Cybex 770A Cross Trainer now. Toughtrain.com is not liable for such cases or instances. 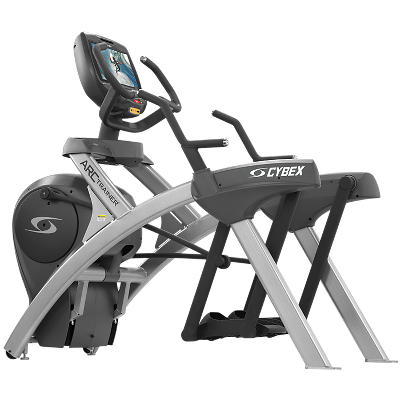 Also we do not recommend any seller for Cybex 770A Cross Trainer and a buyer should buy from where he/she gets best deal with quality of products, service and on time delivery (shipment).